Life, real life, a full life is crazy. It changes all the time. These last two years have been the bearer of many big life events; selling a house, Aislin hospitalized, moving, going back to school, applying and getting into graduate school, my sister having a sudden brain aneurysm, the death of a different sister and then this past May, suffering a herniated disc. Lots of things out of my control. As imagined I put on some fat. I intentionally did not use the word "weight". That accompanied the fat gain but I was still very strong and competing in Olympic lifting. At the end of August I decided I had some time I could dedicate to myself. After losing 20lbs, I participated in a Body composition class at Windy City Crossfit. 1 hour 2 x a week. That's it. The results are posted below. 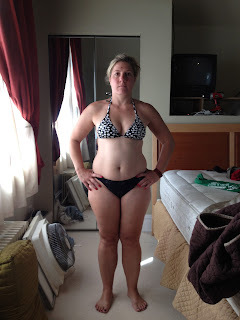 I am in my undies people, but honestly does it look that much different than a bikini? I don't think so. I post these not to taut any kind of superiority but rather to show strength and to mark the new beginning. The fat accumulated with all the stress from the past two years is pretty much gone. I've learned to deal with stress better and to appreciate the journey I'm on and the goals that seem just a hairs breadth out of reach. 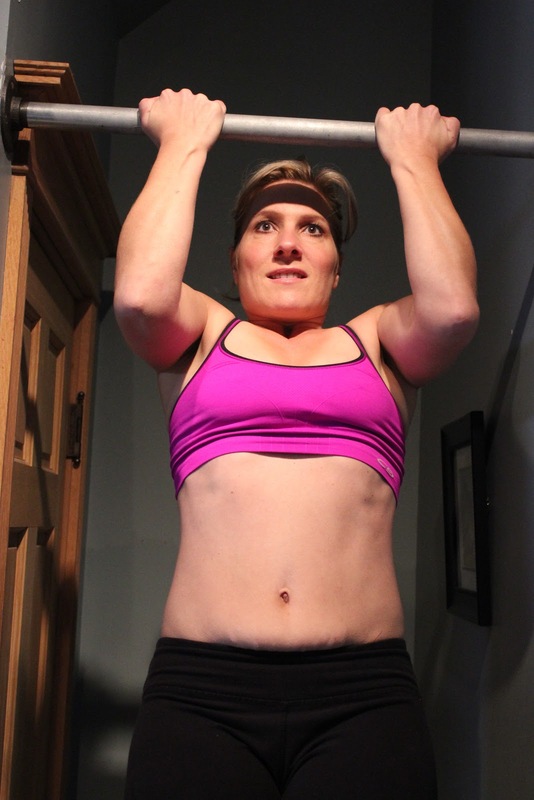 I am strong and can string together about 3 chin ups. My body fat is around 14.5% which I'm told is pretty good. Cellulite, stretch marks and stretched out skin from having babies remains. I continue to work out, started to train Parkour and will be getting back into Olympic lifting as soon as I think the ol' back is ready. I'm feeling good and deal with back discomfort nearly every day. I get Active Release Therapy via my chiropractor which has been immensely helpful (and expensive, sigh). It's the muscles attached near my spine and hips that are too tight and cause problems. I am disciplined to never play the pain med game for this old back. But that was the domain in which I was headed. I took hold of the wheel, turned hard and decided to steer where I wanted to go, not where circumstance has led me. In January I begin Graduate Nursing School at DePaul. Instead of being worried, I am so excited to learn and am ready to grab it by the horns and enjoy the journey. Shout out to Roxanne Engstrom for taking the "hot" photos. She rocks and can take some hot photos of you too! 20 lbs down after body comp class. No dietary restrictions.